You can have a tax bill even if the rent doesn’t cover the mortgage. Letting a lodger share your home can provide a tax-free income under the Rent-a-Room arrangements. Not all things you spend on a rental property can be claimed against the rent. When you sell a rental property you will almost always have to complete the Capital Gains pages of a Tax Return. If you sell a rental property for more than it cost there may be Capital Gains Tax (CGT) to pay. Special relief is available for CGT if you have lived in the property yourself. Most landlords have to file a Self Assessment Tax Return each year. There is a different tax treatment for the cost of getting a property ready for the first tenants and repairing once tenants have been in. Do you know what it is? Making a loss on letting income can reduce the tax on rents in later years. All landlords have to tell HMRC they are letting out property. Accountancy rules and tax requirements for landlords are much more complicated than most ‘non professional’ landlords realise. Getting it wrong can be very expensive! Many of our clients have rental property of various types, sizes and uses. We make sure that you stay well clear of all the potential income tax pitfalls. Fees paid to us to help you with declaring your rental income are tax-deductible. They count as an expense against the rents. 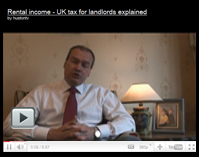 At our YouTube channel you can view explanatory videos about rental income and how it’s taxed. If you need to know more about tax for a rental or Buy-To-Let property, call us now for an initial chat on 028 9080 6080.